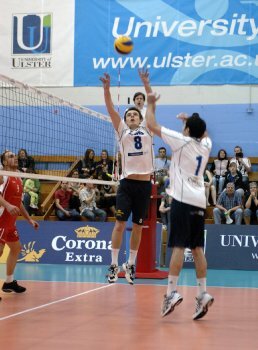 The University of Ulster Elks Men’s Volleyball team have won the All-Ireland Premier League after a thrilling victory over rivals QUB, on the last day of the season. The 3-0 win was their ninth win in 12 games and it is the first time in 10 years that a team from Northern Ireland has won the title. The victory left the Ulster Elks level on points with Aer Lingus and Ballymun Patriots, but a superior set difference of +19 set them ahead of the chasing pack. Elks’ player-coach Nick Wright said after the game: “It has been a real honour to play with these guys this year. We have all put in so much work not just this year but for the past few years and for an Ulster side to win the league for the first time in over 10 years is just rewards for the efforts of everyone on our team. The Ulster Elks team did not disappoint their supporters by winning the first set 25-17. The second set was much like the first, QUB were able to trade points with Ulster for the first half of the set until it was 14-14 and then Ulster picked up their game and comfortably saw out the set 25-17. In the third set with the hard work done, the Elks finished off QUB 25-20. The Ulster Elks Volleyball Club would like to thank their supporters, the University of Ulster and in particular the Sports Centre staff and our sponsors Northern Bank, Corona Extra, Lucozade Sport and Quiksilver for all their help and support all year. The winning Ulster Elks team was, Adam Bell, Mark Hazley, Tom Barrett, Nick Wright, Tom Napier, Niall Madden, Mark Fulton, Paul Spittle, Conor Doherty and Wilson Greenlee.